This mask is a concentrated blend of antioxidants formulated with cell regenerating and clarifying properties that restore radiance and renew your skin. 100% vegan masking formula which deeply purifies, gently exfoliates and liberates your skin from everyday impurities. Our products are natural and contain organic ingredients, with an emphasis on ingredients that are plant-based, organic, and food-grade. No animal testing is conducted on our products or ingredients. All products at Entyze are handmade with love in small batches in the USA. 2.2 oz | 62 g Glass Jar Why use this mask ? What happens is over time, dry and dead skin accumulates on the surface of your skin so exfoliation is key. Exfoliation is the process of removing that top layer of skin to reveal the newer, fresher skin that lies beneath it. This mask is created to remove pollutants and make your skin not just radiant but also younger-looking. Directions: Mix ½-1 tbsp. with the liquid of your choice until a nice paste is formed. Apply onto clean face and let dry. Rinse, Moisturize & Smile! (Liquids you can use are yogurt, raw honey, milk, floral water, tea or whatever you desire to create your unique potion) Ingredients: French green clay (Illite), Spirulina (Arthrospira platensis), Matcha Green Tea (Camellia sinensis), Chlorella (Chlorella pyrenoidosa), Irish Moss (Chondrus crispus), Moringa (Moringa oleifera), Pelargonium (Geranium), Simmondsia chinensis(Jojoba) Oil. 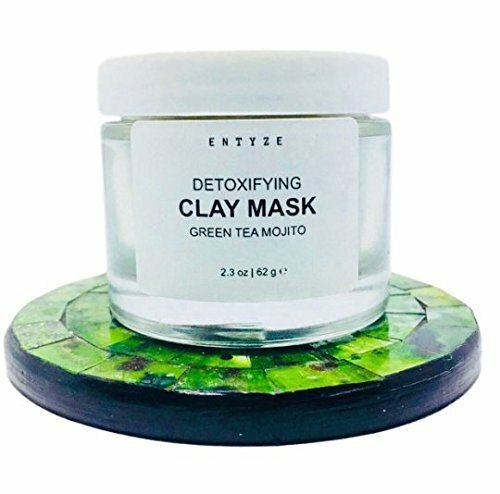 This product is created to be beneficial as an detoxifying treatment mask for all skin types. Please test this product on a small area to be sure it will work well for you. If you have irritation, please discontinue using the mask. *This product does not contain alcohol. Entyze formulates its products without: Parabens, Sulphates and Phthalates. *Every purchase will assist in providing educational opportunity to girls, from socially and economically disadvantaged communities, who traditionally have no access to schooling. If you have any questions about this product by ENTYZE, contact us by completing and submitting the form below. If you are looking for a specif part number, please include it with your message.